Samatha Coventry has been a Jane Austen addict for over 30 years, and also a sewer and a lover of theatre. She dreamed to combine all three loves in one and she finally did by being part of the lovely production of Pride and Prejudice in Naas, Ireland. The play is set to premiere in June so if you live or are traveling close by you must check it out. See trailer below. The cast made this trailer for the play in the beautiful Russborough House (picture above) and she was kind enough to share with us. Russborough House is a stately house situated near the Blessington Lakes in County Wicklow, Ireland, between the towns of Blessington and Ballymore Eustace and is reputed to be the longest house in Ireland, with a frontage measuring 210 m/700 ft. (source Wikipedia). You can see Samantha in the trailer as she plays Lady Lucas and is in the dark blue dress. Now, believe it or not, all of the ladies’s costumes are made by her – the ones she’s worn over the years to the Jane Austen Festival in Bath! There is a great following for Jane Austen in Ireland and a Jane Austen Society was set up in 2013. Samantha is a member and each year there is, at least, one big event. 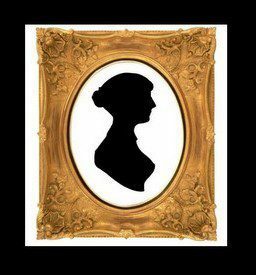 This year is the play Pride and Prejudice (among other events) to mark the 200th anniversary of Jane Austen’s untimely death. This year there will be also a number of balls and events which start in June. The play starts on the 20th of June with an initial run of 5 nights. They will have a little break and then back on the 28th for another 3 nights at The Moat Theatre in Naas – just 40-minute drive from Dublin. Casting for the play started in February and while our director Eilish Rafferty had no problem casting Mr. Darcy (Liam Cooney) it was the end of March before she found Elizabeth Bennet (Rachel Lally). The cast of 18 spent time with Samantha (per director request) and they did some sessions on etiquette and manners in Regency times so that the cast understood how to move and what was appropriate regarding interactions with other characters etc. She has a small part as Lady Lucas as she’s been busy with costumes. Luckily she has a collection of dresses from years of attending the JA Festival in Bath!! They borrowed some of the men’s costumes from other theatre companies and made the rest!! They are looking forward to it and have just mastered Mr. Beveridge’s Maggot for the Netherfield Ball. Click on the link below to see the unforgettable dance from the Pride and Prejudice 1995 BBC adaptation. They have two real couples in the cast (Mrs. Bennet & Sir William Lucas and Mr. Bingley and Charlotte Lucas!!) and Mr. Darcy has never seen a movie or TV adaptation of the book, which I think makes his performance have an extra dimension. Samantha feels she is really lucky as she gets to combine her three passions: Jane Austen, Theatre and dressmaking!!! May the break many legs = the theatre jargon for good luck and all the best! I What a wonderful thing to do! I would love to be able to see it but sadly I am too far away! Thoroughly enjoyed the trailer! Break a leg everyone! Thank you Rita for posting this! Thank you, Hazel, for reading!!! It sounds like a wonderful production, Rita. Thanks for such an interesting post about it. Samantha is a very talented lady and the gowns all look fantastic. I wish I was able to go and see it, but the distance precludes it I’m afraid. Jane Austen in my beloved Ireland! Two darlings in the same place! Wow, the location is stunning and the costumes look amazing! What a talent Samantha is, Rita! The trailer was great fun – what a wonderful idea. I hope it’s a fantastic success! She is amazing! I wish I could see it in person!